My epic MasterClass review: Should you pay for it? Note: This post contains affiliate links which means I’ll make a small commission if you purchase anything from MasterClass. However, it didn’t stop me from sharing the bad and the ugly about MasterClass below. Over the last few months, I’ve completely immersed myself in the online education provider: MasterClass. MasterClass is one of the highest profile online education companies going around at the moment. And I’m obsessed with online education. I couldn’t resist signing up and getting access to instructors of the caliber of Malcolm Gladwell, Christina Aguilera and Aaron Sorkin. This is what I’ll answer in this epic review. By the end of this article, you’ll know the good, the bad and ugly about enrolling in MasterClass. Who should take a MasterClass class? What’s it like taking a MasterClass class? Conclusion: Should you pay for MasterClass? They are a new online education start-up based out of San Francisco. They raised over $56 million and have already delivered their courses to more than one million students. Their video production is world class. In fact, their aim is to bring the quality of Netflix to the $100 billion e-learning industry. They have the world’s best experts. More on this below. It’s a pretty standard approach to online learning. You get access to lessons in the form of video and notes. It honestly boggles my mind that I could access the teachings of so many incredible people. It’s also relatively cheap compared to other online education providers. Below I’ll explain the pricing structure. After reviewing many of the different classes on offer, I came to the conclusion that MasterClass isn’t for everyone. It’s ideal for more creative types of people such as writers, photographers, artists, musicians and painters. If you have a craft like these and you’re looking to learn from the best, it could be the right solution for you. I’ve taken many different online courses before. Usually, I am looking to learn a practical skill that helps me do my job better, or build a better website, or something like this. I recently did an online course on writing better emails to my email list. This was very practically focused and I could use the templates they provided right away. MasterClass isn’t like that. It’s more relevant for people looking for inspiration. They are true to their aim of bringing Netflix to the e-learning industry. The production is world class (I’ll explain this in more detail soon). The other important point to note is that MasterClass isn’t ideal for people who need hands-on contact from instructors. Instead, you’ll need to be someone who is able to learn at your own place. It suits binge-watching inspiration junkies more than anyone. To be honest, that may apply to many of us. But it’s important to know. Before explaining the quality of the video production (which is what I loved the most), let’s first go over the prices. When you’re being taught by the world’s leading experts, you would expect it to cost an arm and a leg. Surprisingly, this isn’t the case with MasterClass. There are two ways to get access to MasterClass. You can purchase an individual class or their All-Access Pass which gives you access to all of the instructors. Each “class” with an instructor costs $90. 20-40 video based lessons (3 to 14 minutes each) with lectures from the particular “master” of the subject you’re learning about. Lifetime access to the program (all of the video content plus accompanying written material). 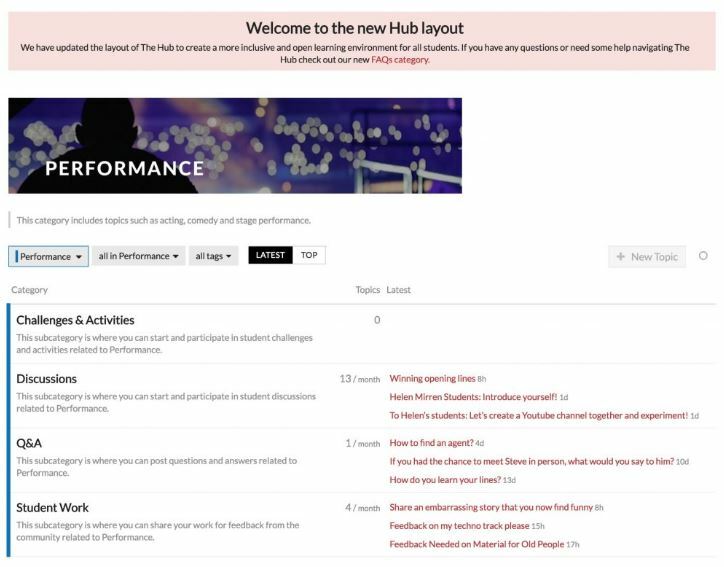 Access to “The Hub”, the community learning portal. Some class members are reportedly lucky enough to get personal feedback from the instructors themselves. However, I didn’t get any feedback and I don’t think you would be wise to assume this will happen to you. Considering how high quality the videos are compared to other online education providers, this is a very competitive price point. Your other option is to purchase the All-Access Pass. This gives you access to every single current and future class available on MasterClass. The cost of the All-Access Pass is $180 per year. Should you purchase an individual class or the All-Access Pass? After reviewing many of the classes, I think there’s real value in getting the All-Access Pass. The reason is that MasterClass has a unique and intuitive interface that shows you related lessons from instructors you may not ordinarily consider. I’ve shared some screenshots for you to see in the next section. If you have access to all of the instructors, you’ll probably have a great experience jumping from one lesson to the other. If there’s two or more instructors you are interested in, I think the All-Access Pass is a good option. However, if there really is only one particular instructor you want to try, then I suggest purchasing just the individual class. Here’s what it looks like, taking one of the classes. 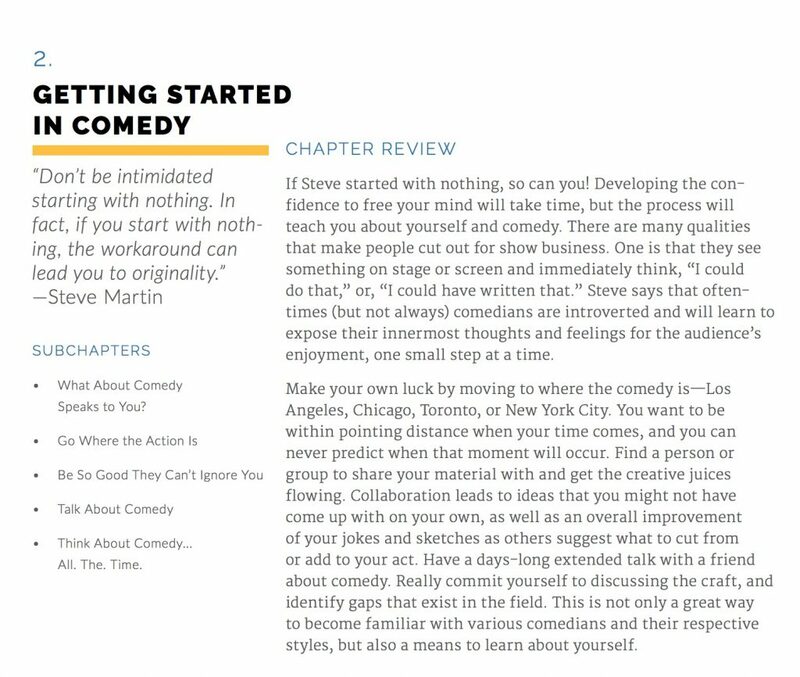 This is the class on comedy by Steve Martin. The class is organized into video based lessons. They are quite short (usually between 3 and 14 minutes each). It’s really easy to make the decision to watch one of them in one sitting. Especially when you know how high quality they are. Unfortunately, you need to purchase access to one of the MasterClasses to see for yourself. This particular class is very interesting. Steve Martin provides many anecdotes from his comedy and films from a very long and fascinating career. There are many insights to gain from the videos. Here is a snapshot of the lesson notes from the Steven Martin MasterClass. I also found the recommended reading to be in-depth and useful. When you purchase the All-Access Pass, you can also experience a unique part of MasterClass. It doesn’t restrict you to watching the lessons in a linear fashion, as you will find with most other online education providers. Instead, you’re encouraged to move from one instructor to another. When you pause the lesson, it shows you a related lesson from another instructor, in this case Samuel L. Jackson. I love this about the All-Access Pass. When I’m immersing myself in the teachings of Malcolm Gladwell, for example, I’m shown lessons from other writers on the platform based on similar topics. It’s a brilliant way to use MasterClass and results in the experience being quite similar to Netflix. More on this shortly. First, I want to tell you a bit more about the video production quality. Hands down, this is the best thing about MasterClass. The videos are so well-produced. I’ve taken many different online courses, and nothing compares to these videos. You can see the quality of the camerawork, the lighting, the sound and even the music. It’s kind of like MasterClass have taken their cameras inside the worlds of these incredible people, and managed to convince them the very best of their inside knowledge. And then they’ve gone and produced these videos as though it was a movie production. It’s a fascinating topic and such an insight into something I would never have access to. After taking many of the classes, I can assure you that they maintain the same quality of the trailers across all of the lessons you’ll have access to. MasterClass is a highly professional and quality look into the minds of the world’s most successful people. I want to give you a peek inside the MasterClass mobile app. As you would expect after looking at the quality of the videos, MasterClass have put some effort into making the design quite simple yet sophisticated. Check out the first screen you’ll find when you log-in after puchasing the All-Access Pass. I scrolled down to the writers as that’s what I’m most interested in. I then selected Malcolm Gladwell. I really love this class. It’s pretty clean and simple. Here’s what it looks like accessing the written content. Overall, everything checks out. It’s a good quality app. Personally, I prefer watching the videos on my laptop but I’m sure many others will predominantly use their phones. MasterClass provides an inside glimpse into the world’s greatest minds. However, do you really want to get this kind of access by paying for online education? It gets back to what I said at the start of this article. I’ve done online courses that are practical and useful for my life. A course in comedy or space exploration doesn’t fit the bill of being practical. Maybe it will be for you. Perhaps you want to be a writer. Or a painter. If so, all power to you. But I think the majority of us have a more applied focus and want to take an online class in something that adds immediate value. This is more of a personal critique. Perhaps it’s different for you. Now, let’s get to the ugly side of MasterClass. I think one of the greatest challenges of online education providers is to deliver courses while cultivating a community. This is one of the best things about traditional education. For all of its faults, it’s amazing for meeting new people in person. Some of my greatest friends today are from my time at university. The community area inside MasterClass. It’s not exactly the most inspiring place to be. It’s more of a bulletin board, and you don’t feel so welcomed to go and meet new people. I think when you’re paying for education, you want to be surrounded by fellow learners. At least, that’s the case with me. I’ve critiqued the practicality and the social learning aspects of MasterClass in the previous two sections. But that doesn’t mean it’s not going to be for you. The best way to think about MasterClass is that it’s an alternative to Netflix or YouTube. What do you usually do when you get home? If you’re anything like me, you probably switch on the television and stream some shows or clips on Netflix and YouTube. But now I have a different option. I can get an educational experience that’s also highly entertaining. The thing about Masterclass is that the videos are quite short but highly engaging. They’re not too heavy and easy to follow along with. Watching MasterClass when I get home has now become a habit. It’s so easy to use and I’m really enjoying it. If you’re looking for a formal education experience, it may not be for you. But if you have a curious mind and want to start consuming educational content but still be entertained in the process, I recommend check out the All-Access Pass. I thought it would be useful for you to get a more in-depth look inside one of the classes, so I’m going to tell you more about one of the most popular: Gordon Ramsay’s MasterClass. Ramsay’s class consists of 20 episodes. They range from teaching you the basics of cooking to creating an effective kitchen layout to mastering different types of ingredients. Each lesson contains videos that run up to 25 minutes, which is longer than the average MasterClass video. Each lesson contains a workbook. And you can join the discussion group. So this all checks out and is what we’d expect. Genefe Navilon from Ideapod provided a pretty comprehensive review of Gordan Ramsay’s MasterClass, and her conclusion mirrors my own. She said that she began not knowing what to expect from Ramsay. She’s seen him being very crass on television and hadn’t previously warmed to him. But after completing all of the lessons, she found there was an additional benefit to being a better cook. She was much more inspired about her own life. “More importantly, I fell in love with cooking in a newfound way. Chef Gordon Ramsay is truly an inspiration. Just hearing about his success story was more than enough for my money’s worth. But it really was his honesty and candidness that I liked watching. “I am someone who is also passionate about my work. And more often than not, I find myself pushing and pushing to achieve a “reward” in my head. As a result, I always chase for perfection and am not satisfied with anything less. “But chef Gordon Ramsay imparted some wisdom in this MasterClass that truly resonated with me. And that is to find balance in your passion and work – how to never forget the reason why you do what you do. More importantly, not to forget that you love it. I think this perfectly explains one of the benefits of MasterClass. It’s incredibly inspirational. There are issues, as covered above. The community learning isn’t the best. The skills you learn aren’t so practical. But it is a truly unique learning experience and really brings out the humanity of the instructors. Personally, I love it and the more I take the classes, the more I’m finding myself recommending MasterClass to others. After doing several of the MasterClass classes, here’s my conclusion about whether you should pay for MasterClass or not. If you feel like you’re lacking inspiration in your life, it may be a good fit for you. 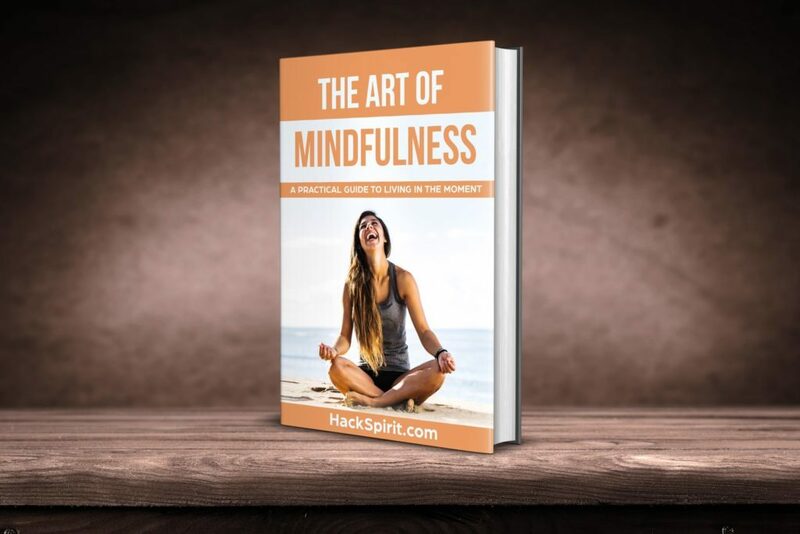 Perhaps you’re a writer struggling with writer’s block, and you want access to the world’s best writers to see how they approach this situation. Or maybe you’re an up-and-coming movie director and you simply want to immerse yourself in the ways of living and thinking of a high quality director. But most likely, you may be someone who simply wants to introduce more educational content into what you watch in the evening. Sometimes, we get inspiration from simply understanding exactly what it’s like to be successful on the world stage. But certainly, we’ve got a lot to learn from the world’s most successful people. The great thing about these MasterClass classes is that you really do get an insider’s feel of what it’s like. I think if any of this applies to you, it’s worth the money. However, if you’re looking for a deeper learning experience, it may not be right for you. By deeper learning experience, what I mean is something where you have the instructor by your side. Where you understand the progress being made by fellow students around you. Where you get that feel of being in a classroom. MasterClass isn’t that. It’s more like getting access to premium video footage that takes you deep inside the mind of a real expert. If that’s what you’re looking for, go for it! You can check them out here, and here’s where to find out more about the All-Access Pass.